There is no doubt that technology plays a monumental role in any modern company, but the unfortunate truth is that you’re probably too busy managing and running your company to give your IT the attention it deserves. That’s why we provide our clients with industry leading IT consulting. We’ll help you leverage your technology so that you can make the most out of your IT investment – helping you boost efficiency, productivity, and your bottom line. Trust the IT experts at Total Computing Solutions to help you get the most out of your technology. Give us a call at (920) 569-2681, or send an e-mail to service@tcsdepere.com to start a confidential discussion about your project or strategy with a member of our team today. We specialize in helping small to medium sized businesses develop a technology strategy to help them reach their goals. We’ll help you leverage your IT investment so that you can use your technology as a catalyst for growth within your company. Total Computing Solutions provides industry leading technology advice that can help you to take strategic steps that will allow your technology to give you the competitive edge. Unlike other IT service providers, Total Computing Solutions takes the time to understand your company’s needs. We won’t recommend something just because it is a technology trend. We only suggest services and solutions that are appropriate to your business needs. Total Computing Solutions will help you find the best solutions and tools for your company, even if it doesn’t come from us. We’ll show you how to make the most out of your technology so that you can feel good about your IT investment. Total Computing Solutions expert IT consulting gives you the confidence in knowing you’re providing your company with the best technology planning possible. 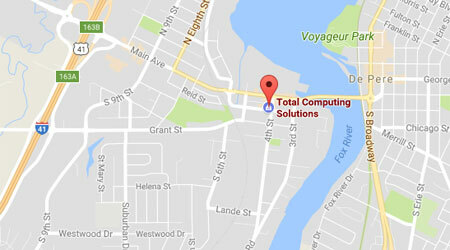 Contact us at (920) 569-2681, or service@tcsdepere.com to learn more about Total Computing Solutions IT consulting and other services.